Dairy series? What dairy series? 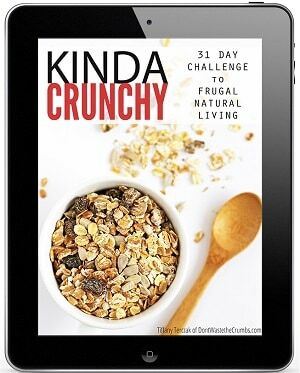 You mean Crumbs actually talks about more than just awesome kitchen appliances and eBooks? 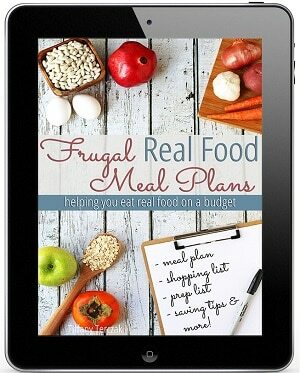 The goal of Crumbs (to help you learn to eat real food on a real budget) has been slightly thwarted these past few weeks no thanks to a super awesome eBook that came out last Tuesday. (Yes, I am biased.) But that doesn’t mean the rest of Crumbs (and my brain) stops working behind the scenes. We’ve talked about dairy kefir before. I wrote a pretty comprehensive “what is kefir” post, a step-by-step tutorial for the visual peeps (although the pictures aren’t that great – sorry! ), and even another tutorial last February on Kitchen Stewardship. 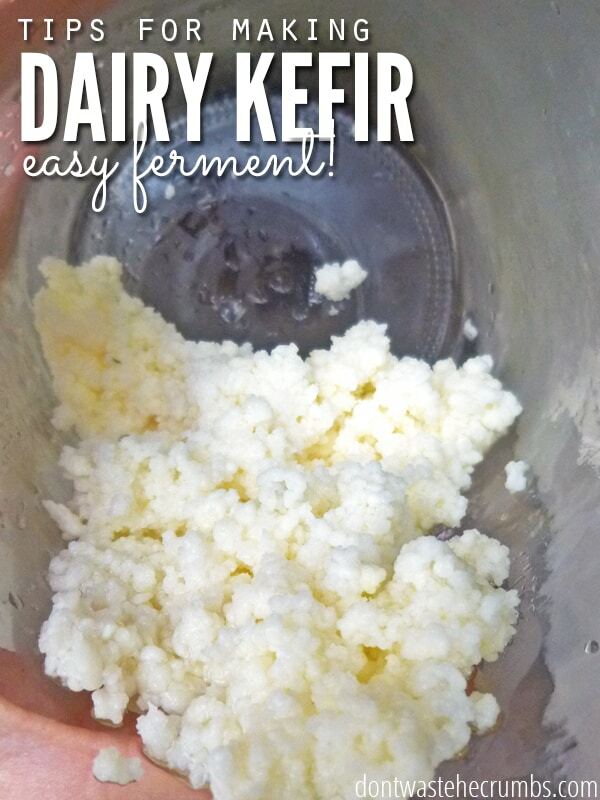 Dairy kefir is hands down, no doubt about it, the EASIEST fermented food you could EVER make on the entire planet. But I fear that many of you haven’t taken the plunge yet. I think there are some (or several) of you that are nervous about milk sitting out on the counter. Shoot, I was too until I actually tried it myself! Take comfort in knowing that while the milk is sitting, it’s fermenting. Fermenting is not the same as going bad. Fermenting simply means there’s a big party where good, healthy bacteria are eating the sugars in the foods (or liquids) and multiplying. Fermenting is a very good thing, and milk becomes healthier as it sits and ferments. Those wonderful, cauliflower-looking kefir grains are producing amazingly healthy bacteria that lines our gut, protecting us from bad bacteria creeping in and standing ground against our immune system. 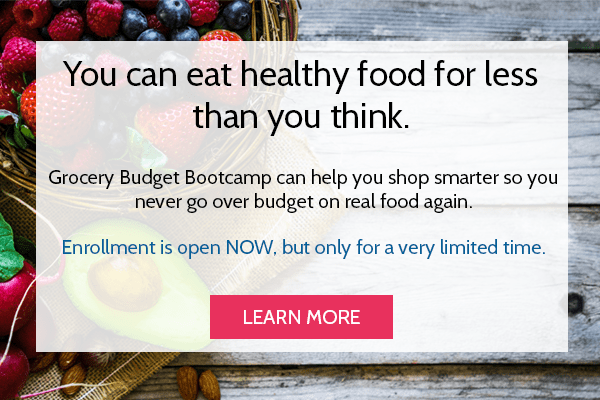 It’s like a powerhouse of healthy food and making your own is truly a baby step towards eating healthier. Just think. It all happens while the jar of milk sits by itself on the counter, seemingly doing nothing to our naked eyes. And we keep living our lives, doing our daily thing, not laying a single finger on the milk. From one busy person to another, doesn’t that sound good to you? 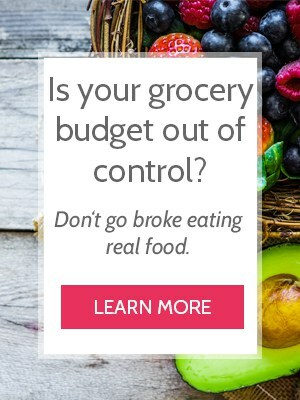 You do nothing and your food gets healthier?! This should be a no brainier! I encourage you today – this week – to take another look at dairy kefir. 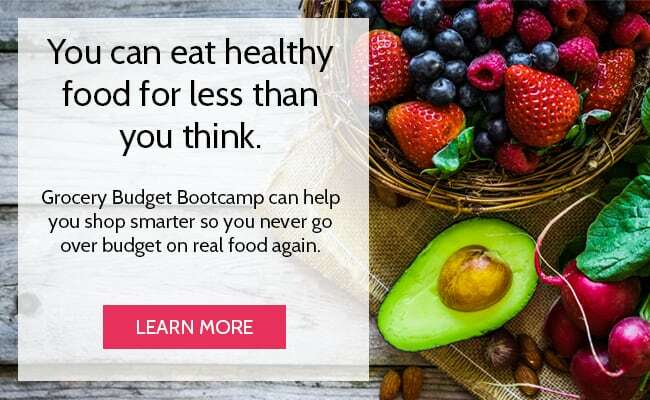 You thought yogurt was healthy? Check this out: Yogurt has 1.5 trillion healthy bacteria while dairy kefir has nearly 5 trillion healthy bacteria! Over three times as much of the good guys and way less work (although this simple yogurt making method is pretty simple). Why should you make dairy kefir? See numbers of healthy bacteria above. Healthy bacteria helps with digestion of food. Healthy bacteria helps to keep the plumbing and pipes clean. It has TONS of vitamins and minerals. How do you make dairy kefir? Active them in milk for 3-10 days. Once active, the grains simply sit in a jar with milk on the counter. 14-36 hours later (depending on the room temperature, the amount of milk and the amount of grains), you have kefir. Can you make non-dairy kefir? With active grains, make a batch of regular kefir. Donate the kefir to your friends or other family members, keep the grains for yourself. Make kefir using your choice of almond milk, hemp milk, cashew milk, coconut milk, peanut milk or rice milk. Make 1-2 batches of non-dairy milk. Make another batch of regular dairy milk. Can you “ruin” kefir grains? As your friend, let me assure you – making kefir IS easy. It’s not that you won’t screw it up – you can’t screw it up! There are no “DO” steps that you can do wrong, because you don’t “do” anything. Plus, kefir grains are known to be very resilient. I’ve starved them, rinsed them, touched them with metal, frozen them, neglected them and even fed them nutrient-free UHT milk *gasp*. But so far, they’ve survived just fine. BUT – you can kill your grains if you go kamikazee and extreme on them. Here are a few practices that you should avoid, just to be on the safe side. Don’t store or keep them in the fridge often. Kefir thrives best when it’s fed (i.e. given new milk) every day or two days. While keeping them in the fridge while you’re out of town for a couple weeks once a year seems fine, you can damage the grains if you keep them in the fridge for 6 out of the 7 days of every week. Possible solution – blend up some of your grains with your smoothies in order to keep the ratio of grains to milk low, or give some grains to your friends and introduce them to real food! Don’t cook the grains, or allow them to get hotter than 100F. Those in warmer climates (or those in cold climates, using their oven to culture! ), beware. Extreme heat will kill your grains. Possible solution – Make a test batch of kefir to see if it cultures. If it does, you’re safe. If it doesn’t, you need knew grains. Don’t rinse them if you have really bad city water. I’ve read multiple bloggers who are against rinsing their grains, but my counter-argument is that I’ve been rinsing them nearly every use and they haven’t died yet. And it’s been over a year now. The only explanation I can think of is that those who rinsed and killed their grains had bad city water. Possible solution – Either don’t rinse your grains, or only rinse with filtered water. I polled a few of my real foodie buddies, asking them what insight they can offer to those who are interested in making kefir, or who have been making it for some time. 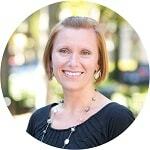 Their advice is spot on, and helpful even to me twelve months into this gig! Are you ready? Do you feel armed with enough information to get started? If not, let me know! Tell me in the comments whether you have or haven’t made dairy kefir yet, and if you haven’t, tell me what’s stopping you from taking this baby step! « Oh Blendtec, How I Love Thy New Twister Jar! I used to make dairy kefir. A friend gave me some grains and I never had any issues with making it, other than having too much sometimes. We came to Calif. for a family emergency in July, and are still out here. My grains unfortunately couldn’t travel with us so I fed them to our dogs. I also used to make kombucha. Our guts really miss them both. Someday soon I hope to start them both back up again! We love dairy kefir. Our favorite is to use it in smoothies. I can’t wait to check all the links. Thanks for sharing! Wonderful! Going to add this link to an article I’m doing on kefir fermented bread dough if you don’t mind. It should post in a week or so at Homestead Lady. Don’t mind at all! Thanks Tessa! I have been making kefir for about 6 months now, and am really enjoying it 🙂 It really is SO simple! Although I am always a little concerened that there is something wrong with my grains when I see pics of other grains… My grains look more like cottage cheese than cauliflower. Is that ok? I recieved my grains from a friend and that is how they looked when I got them, so I kind of figured that it was normal- any thoughts? I think they’re normal Melissa. If your grains are tiny and/or covered with cultured kefir, then they’ll look differently. The ones in pictures are usually rinsed and dried well so you can see them. Mine were super tiny for over a year – they’re just now starting to actually grow! I first drank some homemade kefir while living in Ukraine and I loved it!! I want to make my own (the kind you find in the store had so much other stuff added to it!) But I have a couple questions: Does this work with regular store-bought milk or just unpasteurized milk? Second, is there a way to store the grains without them dying or do you always need to be using them every 6 days or so? I’m not afraid to make some kefir and drink it but my problem is wasting milk. Is there a way to not waste the milk if the first batches don’t turn out real good. I buy raw milk and it’s $15 per gallon so I don’t wanna waste it. Thanks for any help. I’m the only person in my home who likes kefir. How can I keep from being overrun? Hi Sunny! Keep the grains to a minimum. The grains will multiply, so maybe at the start of the week measure out 1-2 Tbsp (or however much works for the amount of milk you’re culturing) and then blend up the rest into a smoothie. Or give them to a friend! Thank you, Tiffany! I didn’t realize it could be that easy…the instructions I got (to rehydrate) said to start with half a glass of milk and gradually work up to four glasses. I was swamped before I even started! It’s not true in that it will still make kefir, but generally speaking ultra-pasteurized milk is the least desired of all the variations of milk because there’s very little beneficial enzymes left. And the processing methods aren’t exactly desired either. Thanks. Just found out very sensitive to casein. Any ideas for milk? After 24 hours I have a cup of fresh kefir and it taste almost there .Texture looks a bit grainy..it is easy but my cup took and hour to drain and the grains going into next batch looks very grainy. So..wondering if I should go to 2% milk as these seem to have alot of milkfat..However, it taste really good and creamy! Have been making Kefir for quite a while now & totally agree that they are tough little boogers. I got mine live from Dom in Australia to LAs Vegas, NV in June & they are going strong. My grains make 3 – 6 batches fully developed & the right consistency. Get on with it already! After all that long windedness, Three batches ago I noticed that the finished Kefir has a slight musty taste. The grains are beautiful and there has never been any discoloration on either the grains or fermenting milk or the finished milk. After the 1st batch that I detected musty taste I washed the grains, did a series of milk changes before I started another ferment. I also changed the jar to clean after every strain & I am still getting the slight musty taste. The smell is completely unchanged. The only thing that has completely changed is that the house is much cooler. Instead of 78 to 80 inside it is now about 64. Would that do it? Sorry should have proof read. Las Vegas, NV…….3-6 batches a week…. It might – it’s hard to say. I remember my grains changing smell and color slightly over time, but it never smelled sour or bad, so I just kept going. I know it has been some time since your question, but I just read it today, and have had a similar experience. My kefir changed taste and consistency at about the same time of the year, and I finally concluded that it was a temperature change (we live in Wyoming). The way I remedied it was to put my kefir next to a lamp with a 40 watt incandescent light bulb turned on. That brought my kefir back to normal. Since then, I have learned that seasonal changes in kefir are perfectly normal and to be expected, especially in the first year they are in your home. They are living organisms, and have to adapt to their new environment. if you have too much Kefir, Sunny, make cottage cheese. As easy as making the kefir; again, all you DO is drain and leave. After draining the kefir, leave it on the bench till it separates into curds and whey (time depends on temperature). Line your strainer with thin clean cotton cloth- old t-shirt, muslin, whatever- with some hanging over the edges. Pour the separated kefir in gently. The whey will run through quickly. 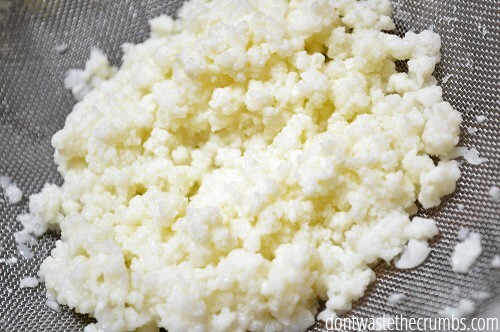 Fold the extra cloth over the curds, and weigh it down- I use a bowl of water. You can give it a squeeze at the start, or just leave it to drip for a couple of hours, till the curds are dryish and hold their shape well. I snip some herbs, add a little salt, for a delicious dip or spread. If it’s too stiff, return a bit of the whey. You can use it any way you use soft cheese. Don’t throw out the whey, it’s full of nutrients and probiotics. Dozens of ways to use it, some on this site. Just checking to make sure. You use fresh raw milk, right? Nope, I use pasteurized milk. Hi ladies, I’m a bit confused. If you buy keifer grains are the dry or mosist when they arrive? Edith way how were the original grains created that are being sold? I don’t have friends that like dairy anything. Not even cheese. I have no one to get any from. I’ve checked the health food stores and they are afraid to pass on info not knowing the cleanliness of the source. My question is where did the original grains come from? How does someone go about creating their own grains from scratch. I can’t find any info on how that is done. I’ve looked in my fox fire books but haven’t found keifer grains. They had to originate from some where in an organic way. I will but some grains but still want to know in a pioneer, or survivalist knowledge how this is done if you need to start from scratch and don’t have access to grains. Most grains are dry when they arrive, unless they’re from a friend who sends them hydrated in milk. Grains grow and multiply on their own during the ferment, so when you buy them, they’re strained from an existing ferment. I don’t know how they were first created, but you can get them on Amazon!